This presentation details UCLA Health’s recycling program, including the types of available containers and what items belong where. This full presentation can be given in person by the Sustainability Manager – simply reach out! This flyer provides a quick overview of the UCLA Health Sustainability program, including tips for how to get involved! This is distributed at the new hire orientation. UCLA Health is helping to reduce the impact to our natural environment. Blue recycling bins are conveniently located throughout the medical centers and medical plazas. If you require a new or additional bin, please submit your request here. 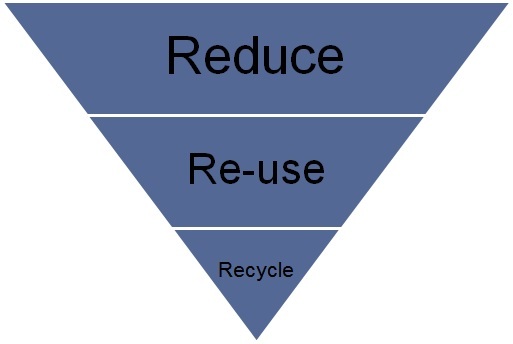 At UCLA Health, we follow the waste hierarchy of the 3R's - Reduce, Reuse, Recycle. We focus our efforts first on reducing the amount of material coming in to our facilities and re-use whenever possible. Our last effort to avoid recyclable material from being sent to the landfill is to recycle. 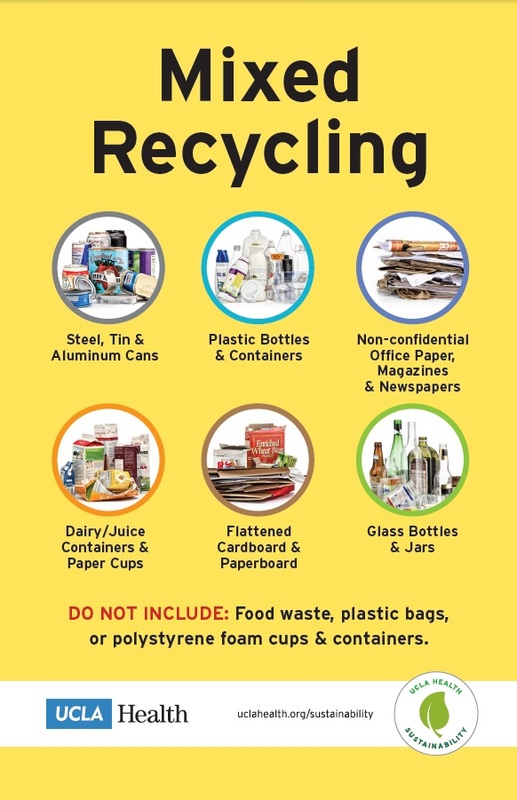 Generally, any plastic, glass, aluminum, paper (non-confidential), cardboard, or similar material can be recycled. A full list of material that is acceptible and not acceptible can be found here. These signs are found on the blue recycling bins which indicate what can be placed in those bins. Please remember to dump the majority of food waste/liquids from the recyclabes before placing them into these bins. If one half-full soda can is thrown in the bin, it will contaminate the entire load and will be thrown in the trash. Let's make sure to keep this material as clean as possible.